Accessed via the Calumet Regional Archives. In an era when African Americans, especially women, were often professionally sidelined, Vivian Carter forced herself onto the field. Through her ingenuity and personal popularity, the musical “matriarch” became a business owner and record producer. Her company, Vee Jay Records, recorded and popularized many successful musicians of the mid-20th century, ranging from Rhythm-and-Blues to Pop Rock, Doo-Wop, Gospel, Soul, and Jazz artists. Although music had been strictly segregated along racial lines, Vee Jay introduced both black and white artists to mixed crowds of local teenagers first, and then to a national audience between 1953 and 1966. The company released recordings of some of the nation’s most prolific musicians, including Little Richard, The Beatles, Jimi Hendrix, and The Four Seasons. Born in 1921 in Tunica, Mississippi, Vivian Carter moved with her brother and parents to Gary at age 6. As a child and teenager, she was competitive, outgoing, and self-confident. These qualities helped her win a 1948 contest for the “best girl disc jockey in Chicago,” which was the beginning of Vivian’s radio career. Eventually, Vivian had a five-hour nightly radio program in Gary, called “Livin’ With Vivian,” referring to female listeners as “Powder Puffs” and male callers “Sponges.” The “hostest who brings you the mostest” played music by black artists and much of what she played was not available on commercial records. Since Vivian owned a record store in the heart of Gary, along with her future husband Jimmy Bracken, she knew that recordings of this music would sell. Courtesy of the NWI Times. Teenagers of all races from several Calumet Region schools would gather after school to watch Vivian through the glass store window while loudspeakers broadcast her favorite Rhythm and Blues recordings, as recalled by Jerry Locasto, a future radio executive who was one of those kids. While the records played, Vivian would come out and mingle with the kids to find out what they liked or disliked about each one. Kids could request songs, and she would play them. In 1953, Vivian and Jimmy started their own record label, called Vee Jay Records from the initials of “Vivian” and “Jimmy,” to record the music of local black artists. Their first group was the Spaniels, a group of crooners from Gary Roosevelt High School, Vivian’s alma mater. The boys walked into the record shop after winning a talent contest at school, to ask if Vivian knew how they could get a recording made. 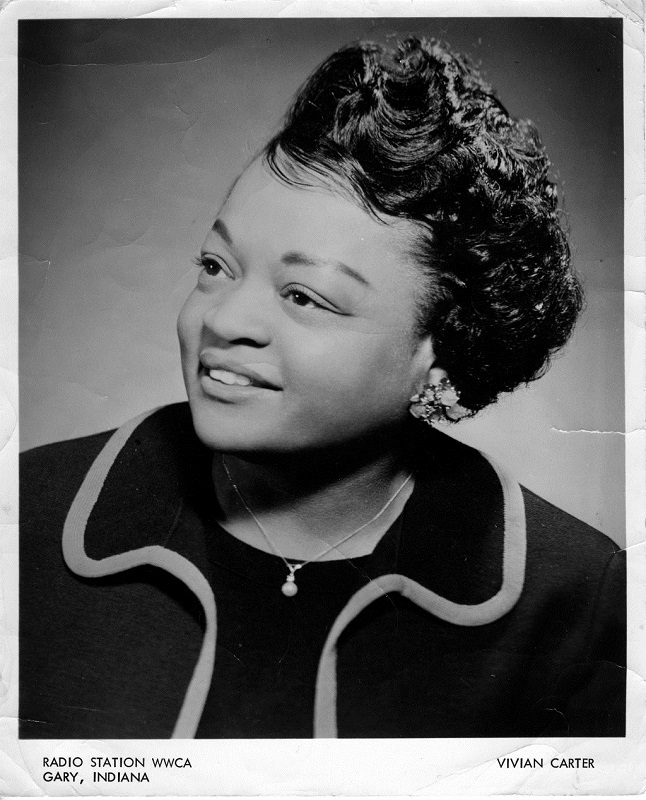 Vivian listened to the group, then gave the impoverished boys a place to practice – her mother’s garage –and arranged to record them at Chance Records, a studio in Chicago. She later bought suits for their publicity photos and a station wagon for their travels. 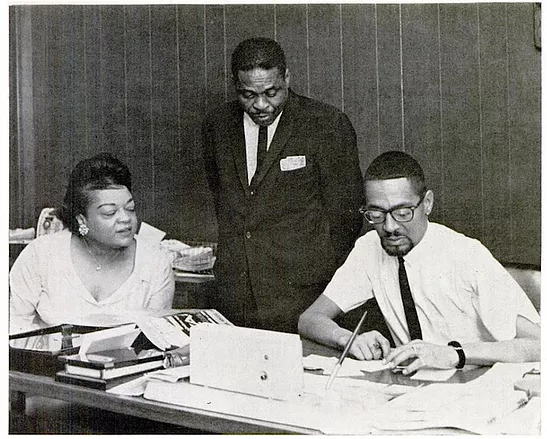 Vivian Carter-Bracken, James Bracken, and Ewart Abner at work, 1961, courtesy of the Made-in-Chicago Museum. The Spaniels’ first record, “Baby, It’s You” reached #10 on the Rhythm and Blues charts. 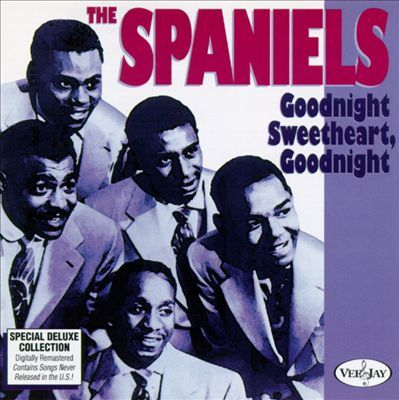 Then the Spaniels hit #5 with their second record, “Goodnite, Sweetheart, Goodnite.” The record “crossed over” from the Race Records category to become a hit with white purchasers as well. But Vivian was disappointed when the McGuire Sisters, a “white girl trio,” sold more copies with their “cover” of the same song. She asked her brother, Calvin, to put more of a white-sounding background on the future records, to appeal to broader audiences. And the young company learned to print and register publishing rights to all their performers’ original songs, so they still made money when other performers covered them. Ewart Abner, courtesy of Discogs. In 1954, Vee Jay moved to Chicago and eventually opened on Michigan Avenue’s “Record Row.” Vivian, Calvin, and her husband Jimmy remained the heads of the company. But according to Bob Kostanczuk of the Gary Post-Tribune, Vivian was always “viewed as the company’s matriarch and driving force.” They hired the knowledgeable Ewart Abner, accountant for the former Chance Records, after Chance went out of business. Abner started as manager and eventually worked his way up to president. 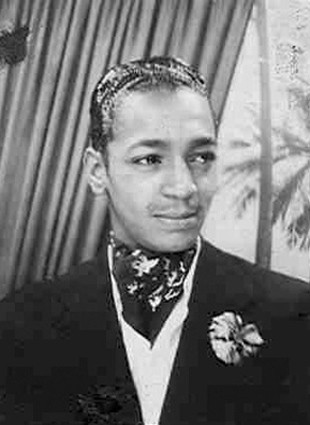 In the next ten years, Vee Jay Records released successful recordings of black and white performers, including hits like The Four Seasons’s “Big Girls Don’t Cry,” The Dells “Oh, What a Night,” and The Beatles’s “Love Me Do” and “Twist and Shout.” Since radio stations wouldn’t play several records from one company label in the same time slot, Vee Jay also recorded under the labels Falcon, Conrad, Tollie, and Abner, from the middle names of the company’s principals. Vee Jay opened a Los Angeles studio, and Vivian and Jimmy soon drove around in luxury convertibles and fur coats. Courtesy of the Made-in-Chicago Museum. Vee Jay’s best (and worst) luck came in 1962 when they tried to buy distribution rights for Australian singer Frank Ifield’s European hit single “I Remember You.” The Gary Post-Tribune on August 23, 1998, noted that the British agent insisted they also take a quartet named The Beatles, unknown at that time in the United States. Vee Jay released several Beatles singles and their first U. S. album, to lukewarm success until the group appeared on the nationwide Ed Sullivan Show. Then Beatles’ sales skyrocketed. 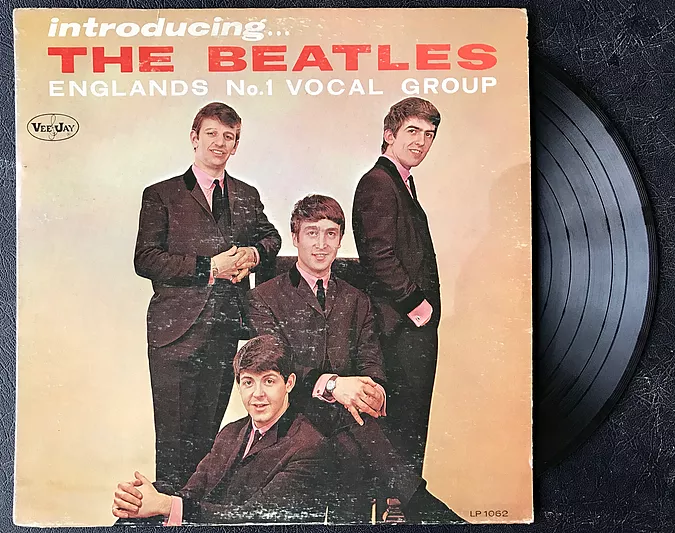 Capitol Records, who had earlier turned down the Beatles, started filing lawsuits against Vee Jay to get the group back, as reported by Mike Callahan in “The Vee Jay Story” in Goldmine (May 1981). The cost of defending the lawsuits, in addition to Ewart Abner’s poor financial management and gambling habit, wiped out Vee Jay’s money and credit, and put the company out of business. 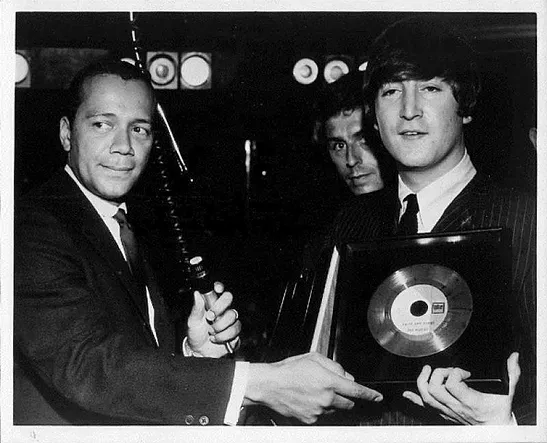 Vee Jay president Randy Wood presenting a gold record to John Lennon, courtesy of the Made-in-Chicago Museum. For photos and a brief history of Vee Jay Records, see Andrew Clayman’s article for the Made-in-Chicago Museum. Learn more with James B. Lane’s article in Traces of Indiana and Midwestern History, Winter 2011, Vol. 23, pp 48-55.